A global changelog covering all the changes in all CGAL versions can be found here. Semantic versioning is used to number the CGAL releases: the version of a release is a sequence of three digits (Major.Minor.Patch), and an optional pre-release tag in the case of beta versions. All the CGAL releases are listed below. Each release's page contains the list of changes that this specific release brought, as well links to download the release and access the CGAL documentation at that time. 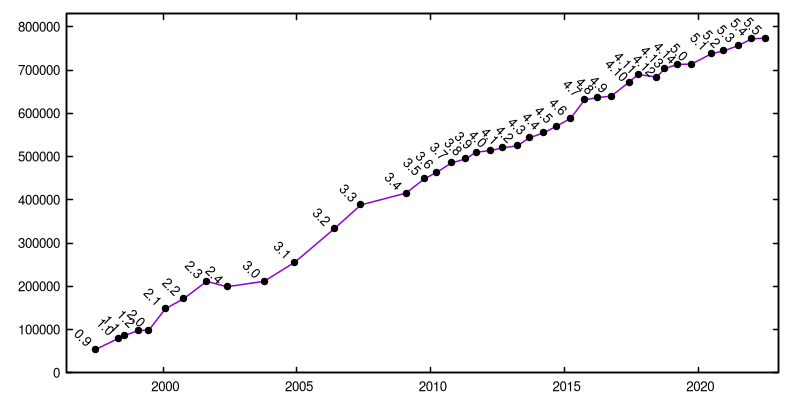 Number of lines of code of CGAL (using David A. Wheeler's 'SLOCCount', restricted to the include/CGAL/ and src/ directories).